In the darkness of the JFK Library’s auditorium, the Hingham Harbormen, the reigning Division 2 baseball state champions, shifted uneasily in their seats. Nearby, jet-lagged students from Osaka, Japan, here on a weeklong exchange program with their baseball hosts, sat separately, erect and motionless. On the screen was a biography about John F. Kennedy that included World War II and the Japanese attacks. The visitors stayed with host families and shadowed their counterparts in school for a week last month. The sightseeing itinerary included a tour of Fenway Park, where the young Japanese players bowed to the Green Monster and received a ball autographed by Osaka native Koji Uehara from the Red Sox. They also attended a Celtics game, toured Harvard University, and hiked the Freedom Trail. The Osaka kids spoke some English, the Hingham kids spoke no Japanese, and there was only one interpreter. But it hardly mattered, because everyone spoke baseball. Hideshi Masa, the Tennoji manager, was thrilled with the experience. Baseball in America is more free-wheeling than in Japan, where it is more disciplined, said Masa. “I feel like American kids are more dynamic,” he said. “In Japan, nobody wants to make a mistake.” The Japanese practice all year long, sometimes both before and after school. They play nine-inning games instead of seven. On the last full day, an exhibition game was played between the teams. It was highly anticipated by the Tennoji players but downplayed by the Hingham coaches. “It’s definitely first scrimmage mood for us, despite how everyone else might want to take it,” said Hingham head coach Frank Niles. “But it’s a good thing, we need the at-bats.” Most of the approximately 250 fans in attendance were rooting for the visitors. The smell of onions and sausages, grilled by The Sausage Guy, wafted over the third base line. Tennoji won, 3-1, on two long home runs by right fielder Jyunpei Miyata. 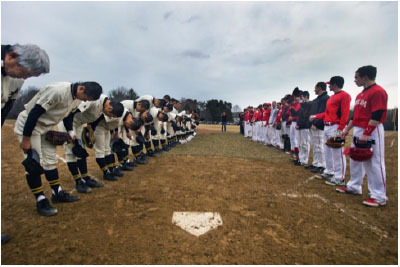 Photo: Members of the Tennoji team bowed to their opponents before the teams’ scrimmage.